Motorcycle riders face unique dangers that put them at greater risk than others on our roads and highways. Bikers are exposed, with nothing but a helmet and clothing to protect them in even a minor motorcycle accident. The Texas lawyers at The Law Offices of Frank L. Branson understand the unique challenges of cases involving motorcycle accidents. 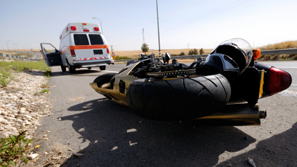 When accidents occur, motorcycles are at a distinct disadvantage compared to cars. The attorneys at The Law Offices of Frank L. Branson represent bikers hurt as a result of numerous causes of catastrophic motorcycle crashes, including driver inattentiveness, a driver who did not see a motorcyclist, a driver making a left turn in front of a motorcyclist, and a driver making an unsafe lane change in front of a motorcyclist. Due to the exposed nature of a motorcycle, motorcycle riders easily can suffer serious injuries and death during an accident. Attorney Frank L. Branson and his team handle motorcycle cases involving serious and catastrophic injuries, including traumatic brain and head injuries, spinal cord injuries, amputation, road rash and disfigurement, and broken or fractured bones. To learn more about our experience in motorcycle accident matters, we invite you to contact the firm here.